Last week, I tried to help you figure out if you’re stuck. Acknowledging that you’re stuck is important, because we cannot fix something if we don’t know it needs fixing. 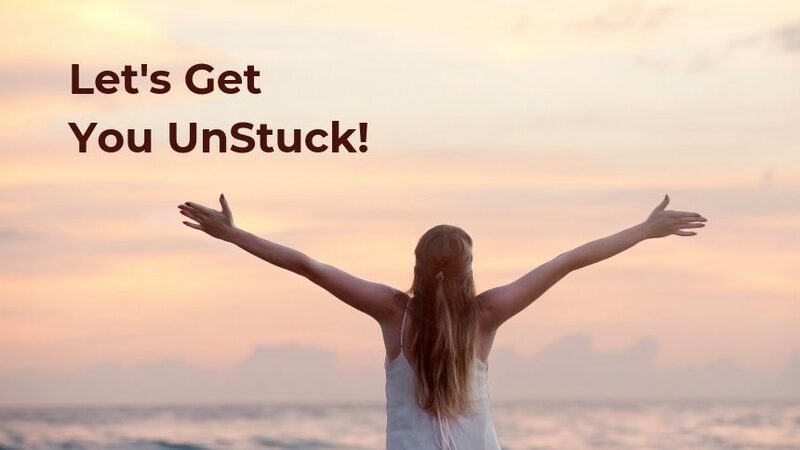 So I know you’ve been waiting for the answer to the question how do I get myself unstuck? Continue to talk about the issue/situation/dilemma with your friends, partner, therapist, or anyone else who will listen. Eric Zimmer, the host of one of my favorite podcasts, The One You Feed, says it best: “Don’t try harder, try differently.” Often, continuing to talk and rehash it only keeps you spinning and doesn’t move you closer to action. If your situation involves feelings of worry and/or anxiety, I suspect you’re “doing the disorder” by seeking certainty and comfort in a situation where there’s uncertainty. Put action off because you need more time to think about it or you’re too busy right now but you’ll get to it tomorrow/when things settle down/after spring break. When was the last time procrastination worked in your favor? Do it alone. Saying what you want to change out loud makes a difference, as does having some support and accountability. Do one thing differently each day that works toward your goal. It doesn’t have to be a seismic movement but something that points you in the direction you want to go. Try to start your day with this intentional action toward your change. It can set the tone for the rest of your day. Enlist an accountability partner. Choose someone to report into, tell them your goal, and ask them to hold you accountable. If you notice yourself stuck in your old stories and self talk, try to change one thing in that moment. It may be your breathing, where you’re holding tension, your physical posture. A simple change can start a chain reaction that can loosen your grip on your harmful Ultimately, your thoughts remain but your relationship to them may change. The thought that I cannot handle this feeling may still be there, but you’re not freaking out in response to it. You recognize it as a thought — something that will pass — and act in spite of it. What do you think? Doable? Share your experiences with me on Facebook or Instagram. If you’d like to talk more in-depth and privately, contact me!